We’re less than a week away from the Justice League movie! Will it be terrible? Can a third weekend of Thor: Ragnarok defeat it at the box office? I kind of hope so! To celebrate, lets read some Batman, Mister Miracle, Ms. Marvel and Runaways comics! 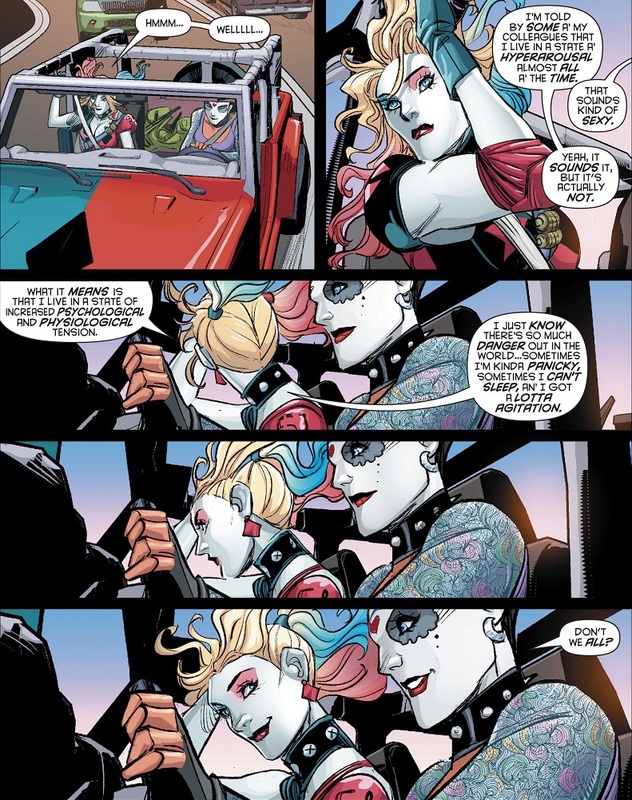 Comic Book of the Week goes to the latest issue of Harley Quinn! The creative team really delivers a stunning cliffhanger to take us into the final issues. It’s exactly what this comic needed! So are they all stacked up on top of each other? I also highly recommend checking out this week’s issue of Unbeatable Squirrel Girl! I didn’t review the issue because it’s a smattering of short vignettes, possibly done to raise money for a charity? It’s hard to tell, but the stories are delightful! Comic Review: Detective Comics #968, Harley Quinn #31, Mister Miracle #4, Ms. Marvel #24 and Runaways #3. As much as I love Tim Drake, I almost feel like this issue featured too much Tim Drake. That sounds weird as I say it out loud. Batman and the Robins team up to take on Evil Future Fascist Batman, but he defeats them all because he knows them too well. EFFB makes his escape and lets Red Robin follow him, trapping him in a shuttle car heading for the Belfry so that he can once again try to reason with Young Tim Drake about how all of this is necessary. Of course, he does not convince Young Tim, so he goes to confront Batwoman directly. But then Red Robin and Batwing take control of Brother Eye, and Batman and the remaining Robins all fly Batplanes to take down the attack drones. EFFB is forced to accept that he couldn’t change anything and he says Red Robin will have to soon face the events that set him down the path of becoming EFFB. Then he disappears back into the time stream as Hypertime corrects itself. This issue was good and solid action, but most if it was just set-up for future stories. This issue was packed with a lot of dialogue, all of it shaded in mystery and a distinct lack of just coming out and saying what you’re talking about. Despite going to great lengths to try and stop Batwoman from destroying the world around him, Future Tim never just tells Young Tim what exactly Batwoman is going to do. Like, you go so far as to take on the entire Bat-Family in an effort to murder one of their own, but you can’t just sit your younger self down and tell him exactly what happens so that he can be prepared? It doesn’t make sense from a character perspective, but it makes total sense from a reader’s perspective, because obviously that big storyline is next and Tynion doesn’t want to spoil any upcoming surprises. That’s all well and good, but I feel this could have been a stronger issue if he’d gone that route, instead of just everybody scrambling to take down a single-issue threat — a threat that takes attention away from the happy feeling of Tim Drake being back. TL;DR: A ton of secretive dialogue mellows out this solid, action-packed comic. 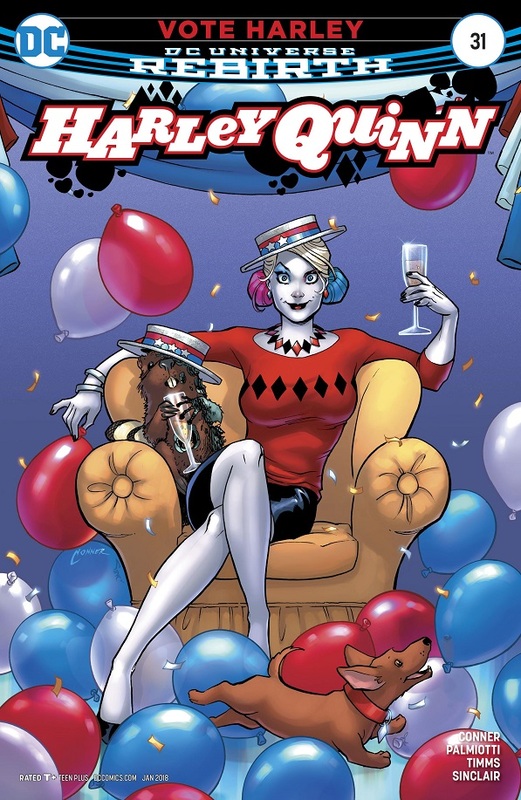 There are only a few issues of the Conner/Palmiotti Harley Quinn left, and I’m excited to see them going out with a bang! 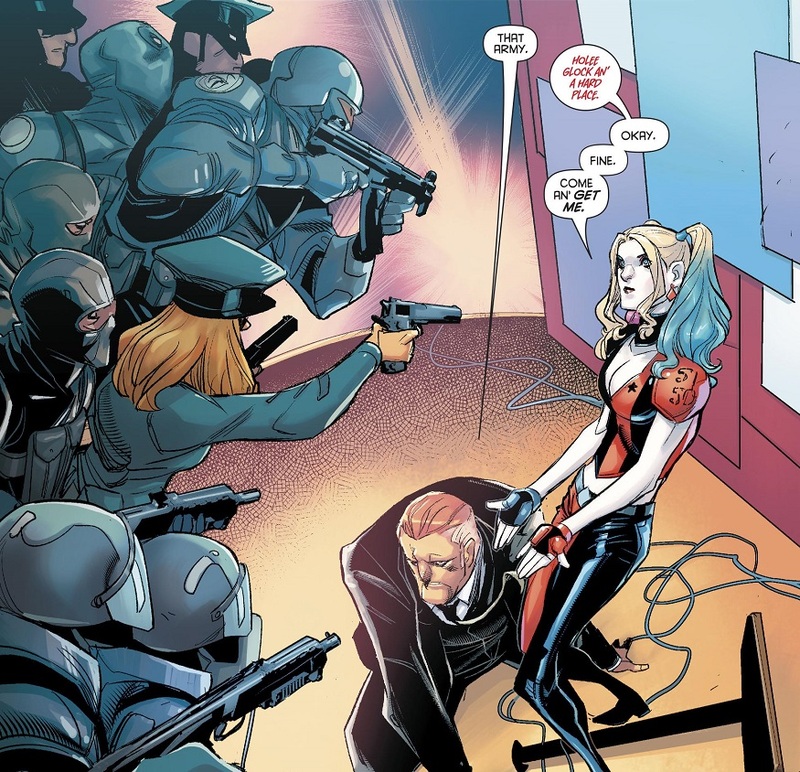 Harley and her people quickly deduce that it was the Evil Mayor who kidnapped Mason, so they begin to mobilize. Harley winds up in jail for the night after confronting the Evil Mayor on the debate stage, but Chief Spoonsdale lets her out. Through all of their various deducifying, they discover that Mason is being held on Fire Island, just outside the city. Harley and Sinn gear up and head out, burying the hatchet on the way by comparing mental illnesses. Before they can storm the castle, however, they’re caught by the Evil Mayor’s men and carried inside. Harley is then forced to watch via TV screen as the Evil Mayor shoots Mason in the head! There it is! There’s the energy that has been missing from Harley Quinn recently! Part of me was a little worried that Conner and Palmiotti wouldn’t go through with it. The cast is big enough, I felt for sure someone would bust in and save Mason at the last possible second. But he needed to die. It needed to be this hard. Granted, it’s a bit cliche for Mason and Harley to have such a lovely time in the previous issue, only for him to get killed in this issue, but it absolutely works. Harley, the character, has been cruising on Easy Street for some time now. As we near the conclusion of this epic run, the stakes had to be as big as possible. Mission accomplished. I still would have preferred that the villain be Red Tool, but I can live with the Evil Mayor being the Big Bad in the end. He represents a villain that Harley riled through her direct action. She’s the one who decided to run for mayor herself, hitting the Evil Mayor right where it hurts. She could have handled this guy any number of Harley Quinn ways, but she had to go big and theatrical, and now Harley has paid the price hard. I can’t wait to see what happens next. The rest of the issue was solid. Everybody gets a little part to play, and all the characters remain cool. The chat between Harley and Sinn was a solid understanding of both characters, especially Harley, and is the sort of thing one would hope to see as we build up to the end. TL;DR: What starts out as a perfectly nice, enjoyable issue of Harley Quinn delivers the sort of ending I really wanted to see as we near the end of this memorable run. Madness. This comic is madness. But that’s probably what makes it so good. While Scott is recovering in bed, Lightray arrives to declare him an agent of Darkseid and offers him an execution or trial. Scott casually picks trial and wants it to be in his apartment for ease (Barda is none too pleased with any of this). 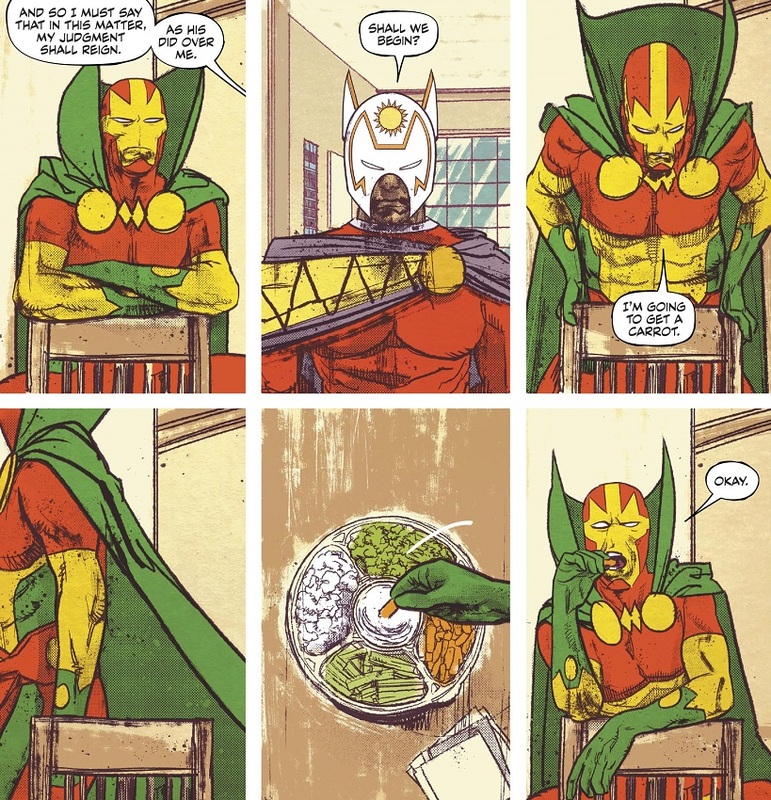 Following his next show, Mister Miracle and Big Barda suit up in his apartment while Orion and Lightray show up for the trial. Orion declares himself accuser, defender and judge all in one and begins asking Scott true or false questions to determine if he’s possessed by the Anti-Life Equation (with the screen going fuzzy every time the possibility is brought up that Orion might be possessed by the Anti-Life Equation). The questioning gets pretty intense and I can’t do it justice here in this recap. Orion starts circling around the idea that Scott hates himself and life, and that since the Anti-Life Equation is hate, that Scott…might be the Anti-Life Equation! At that suggestion, Scott freaks out and starts roaring as he smashes Orion, knocking his helmet off. A stunned Orion takes a moment and judges Scott as guilty. The execution will be in three days. 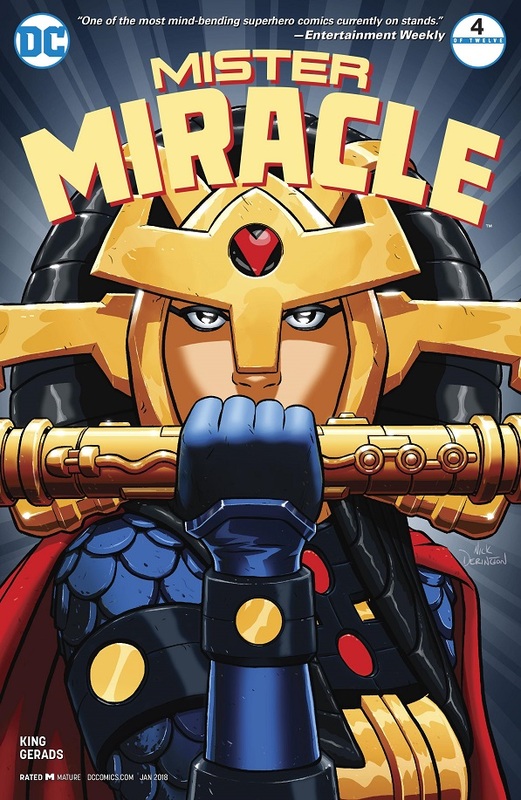 Also, there’s definitely something going on with Big Barda. I love the disjointed feeling when King and Gerads juxtapose the ordinary with the weird New Gods stuff. Like Scott lazily getting out of bed and making coffee while Lightray, in full costume, informs him of the charges and trial. Or everybody eating from a veggie tray during Scott’s trial (with the spectators sitting on the couch). It’s a neat way to explore the world of the New Gods while telling whatever insane story King is telling. I’ve said this before, and nothing has changed, but I’m pretty sure we’re not supposed to believe nearly anything in this comic. When the Anti-Life Equation is active, who knows what’s true? Who knows what any of it means? Why does the ‘screen’ get wonky when Scott answers questions about Orion being infected? Or on certain other questions? Were those lies that he didn’t know were lies because he’s infected? It’s maddening. But it’s also really tense and thrilling, as Orion’s questioning just keep circling around something very dangerous at play. And while Orion is outwardly dangerous, there’s something brewing under the surface with Big Barda, and that’s probably even more dangerous! TL;DR: This book remains stylishly insane, while telling a pretty gripping story about the madness of the New Gods. I loved the previous issue, and this one is rather nice as well. It also promises fun things in the future! Ms. Marvel and Red Dagger continue to try to figure out how to stop the slowly speeding train — only now their bickering has turned to awkward compliments and flirts. Ms. Marvel checks in with the conductor and suggests they switch off to an old track and use natural hills to slow them down — but the switch instead causes the train to go faster! So Ms. Marvel jumps off the back, grabs the train and just tries to stop it by digging her heels in. With some help from Red Dagger, they pull it off! The media then converges on the area to interview the heroes, shoving Ms. Marvel out of the way to fawn over Red Dagger. Kamala stomps off, annoyed that she is so easily forgotten. 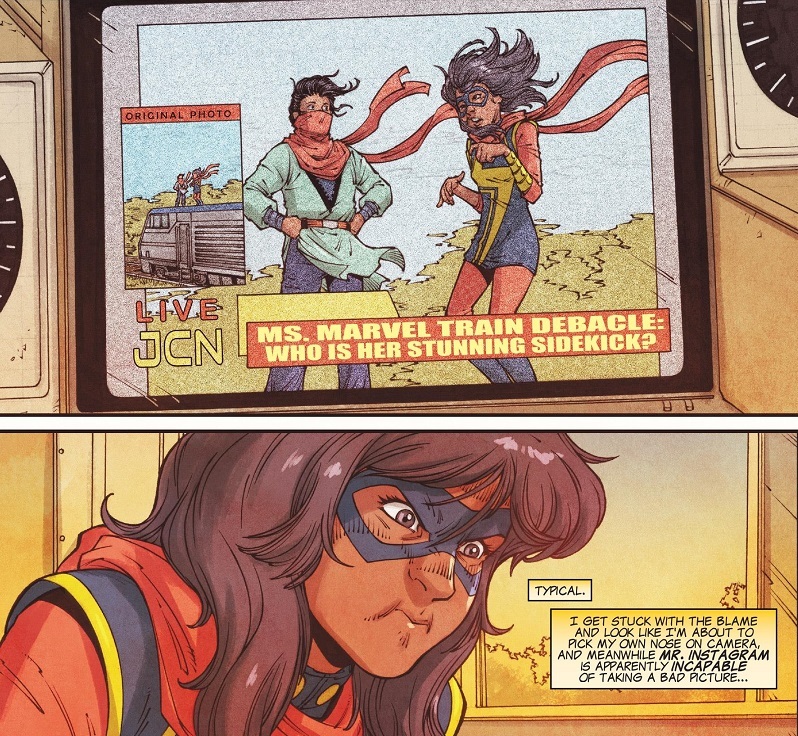 And she decides that perhaps she should spend some time focusing on Kamala Khan instead of Ms. Marvel. This issue wasn’t as laugh out loud funny or as charming as the previous one, but it was still quite enjoyable. The art, especially, is a revelation. This Olortegui is going places, and I hope one of those places is future issues of Ms. Marvel. His art is very detailed with a lot of personality. 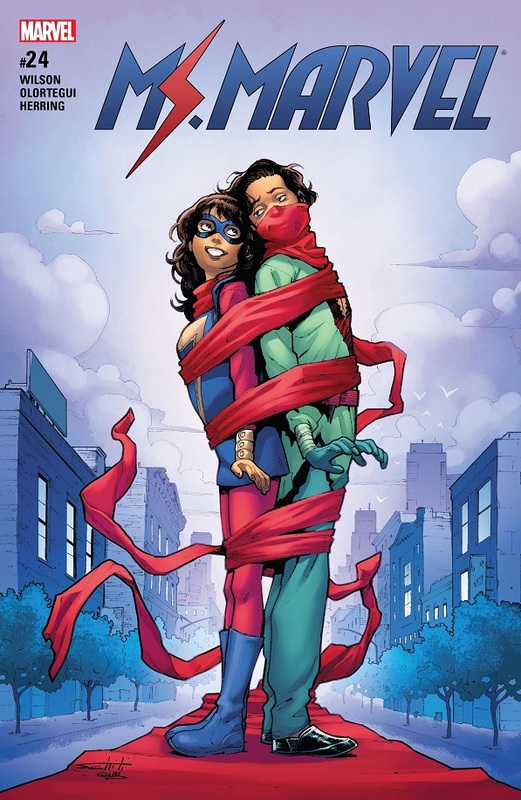 Kamala’s got some great expressions in this issue, and he’s already mastered how to really show off her stretchy powers. The story is really good, too. 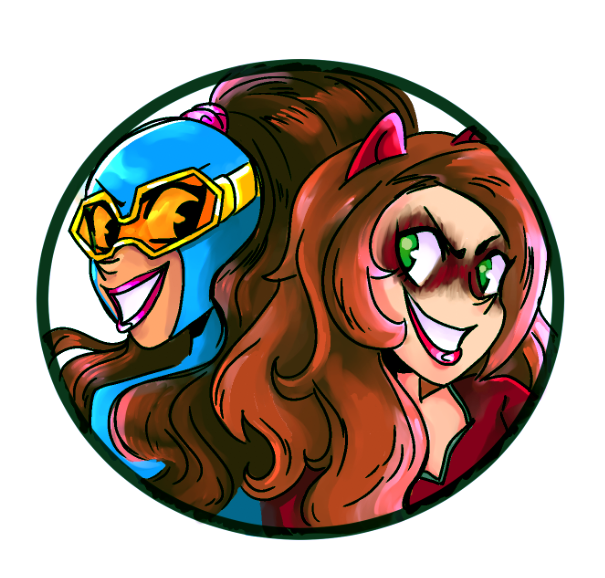 It’s just a couple of superheroes helping out in a crisis, and a slow moving crisis at that, so they’ve got plenty of time to stop and smell the roses along the way. They flirt, and it’s cute. They do something heroic, and it’s awesome. Wilson really stretches her legs with this issue and it makes for a more rewarding reading experience. And I really like the idea of Kamala spending some time focusing on Kamala, in response to the pretty crazy superhero debut she’s lived through over the past few years. It’s a solid life lesson for this character to learn at this point in her life. TL;DR: This fun little Ms. Marvel storyline comes to a fun little conclusion. The new artist seems like a godsend! I hope the slow pace of this comic isn’t ruining sales. It’s a slow book, but I’m loving what Rowell is doing with the very concept of the Runaways. Gert, Nico, Chase and Old Lace show up at Karolina’s dorm room to recruit her to runaway with them! But the thing is, Karolina is really happy with her life. She’s going to college, she’s got a great girlfriend and she’s going to therapy to take care of any lingering anxieties from her youth — but the sudden arrival of all these old friends is putting a serious kink in her comfortability. She’s got a good life! How can they even suggest she throw it all away just to be a Runaway again? It’s not like they were a legit superhero team with a mission. They were just a bunch of kids stuck together trying to survive, because they didn’t have anything or anyone else. But now they’ve grown up. She’s grown up. Gert leaves disappointed and Chase follows her out. Nico stays a bit longer, completely agreeing with Karolina that she’s got a good life here and shouldn’t go with them. But Nico says Nico doesn’t have a particularly good life, and the thought of just running away again with her friends is pretty appealing. After Chase cheers up Gert, Nico rejoins them and they set out to find Molly. Meanwhile, Chase has been working on fixing Victor’s head, and we see that his internal systems are rebooting — rebooting into Victorious mode! I love the complex questions that Rowell is injecting into the very premise of Runaways! This isn’t just a comic where the Runaways are together going on wacky adventures, as could have easily been the reboot (I’m thinking Marvel’s answer to the Lumberjanes). Instead, Rowell is using the ‘resurrection’ of Gert to draw a line separating the carefree comic book nature of the original Runaways series with the very realistic fact that kids grow up and real lives are real important. 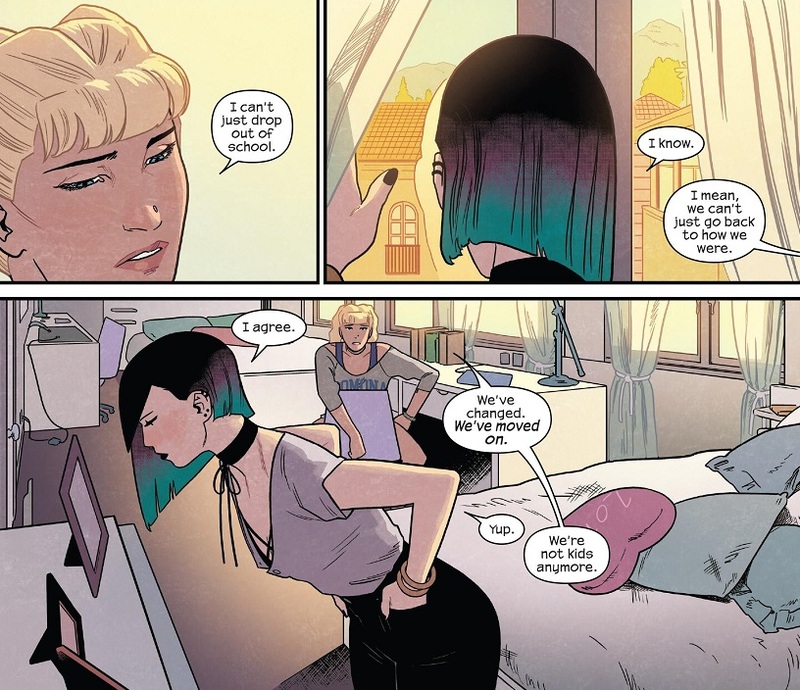 Nico and Karolina are living very real lives in this series. For one of them, she wouldn’t mind abandoning her dingy apartment and going on adventures with her friends again. For the other, it’s pure madness to give up everything she has for nothing. Those are very real reactions to the very concept of the Runaways, and I love that Rowell is going there. And Karolina is right in her assessment of the original series: it was unsustainable. Were those kids just going to be on the run forever? No, that’s ridiculous. And what are they offering Karolina now? To all just hop in Chase’s van and track down who? Random super-villains? Why? None of them are qualified to raise Molly when they try and grab her. I love that Rowell is using the natural progression of time and these characters to practically spit in the face of the very concept of the Runaways for her reunion comic. It’s genius! And it’s well written with great art, too. I can’t wait to see where all of this is going and I hope the slowness doesn’t stop people from reading. Also, if Karolina does just throw away her life to rejoin the group, I will be severely disappointed. 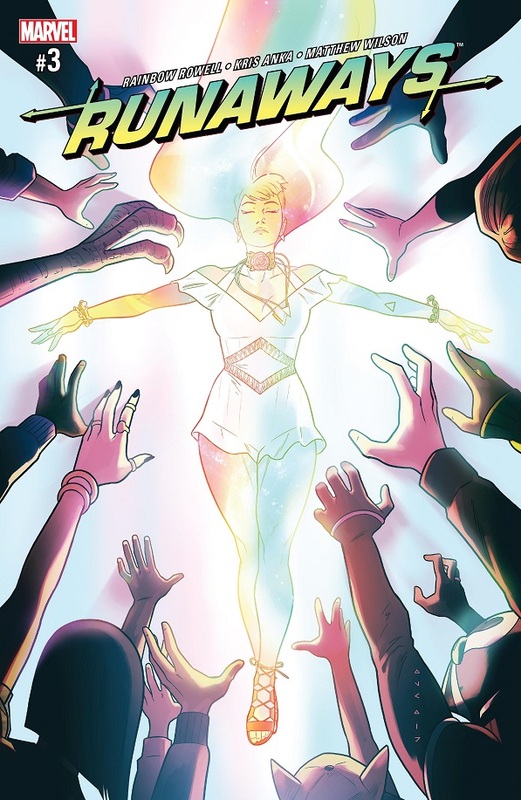 Obviously I want Karolina in the comic, but Rowell needs to build on what she established in this issue. TL;DR: This isn’t just your average comic relaunch and I love it for that fact. The creative team is using the natural progression of time to explore and pick apart the very premise of this comic, which is a genius reason for a relaunch! 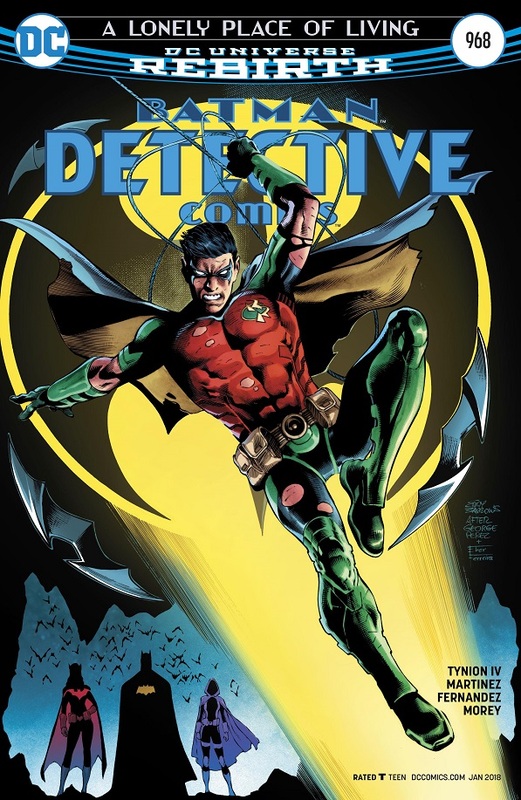 Posted on November 11, 2017, in Batman, Comics, DC, Marvel, Reviews, Robin and tagged Detective Comics, Harley Quinn, Mister Miracle, Ms. Marvel, Red Robin, Runaways, Tim Drake. Bookmark the permalink. 2 Comments. Ms. Marvel was great. I love her interplay with Red Dagger. And the faces she makes. Olortegui is so good at that. Lots of really fun moments. Runaways was good. Poor Karolina. She was happy, and then Nico had to walk back into her life. Kind of a shame Julie doesn’t actually appear here, but hopefully she’ll show up in future issues. Squirrel Girl was great. I think the “raising money” was just a joke. If it was actually raising money, it would’ve specified where the money was going. But yeah, really fun comic. Oh yeah, you’re probably right about the fundraising aspect. It just seemed like an established bit that Ryan North was doing. Perhaps he’s done similar stunts in his previous comics…Still, very fun issue!